So by now we’ve all seen The Force Awakens and we can all agree that although the movie was full of really amazing practical effects (did you know the bread was real?) BB-8 is by far the best of them. If your love for the newest addition to the droid family extends beyond the screen, check out the BB-8 Life Size LED Floor Lamp. This is probably the closest you’re going to get to having an actual BB-8 unit in your home unless you build it yourself (internet tutorials on how to do so abound). Sure, it won’t follow you around, chirping pleasantly and giving you a lighter thumbs up but it will provide light to whatever space you put it in. This unit has three lighting settings, cold white, amber, and warm white letting your choose what works best for your space. He is 26” tall and you activate him with a gentle tap on his head. He works on normal AC power. 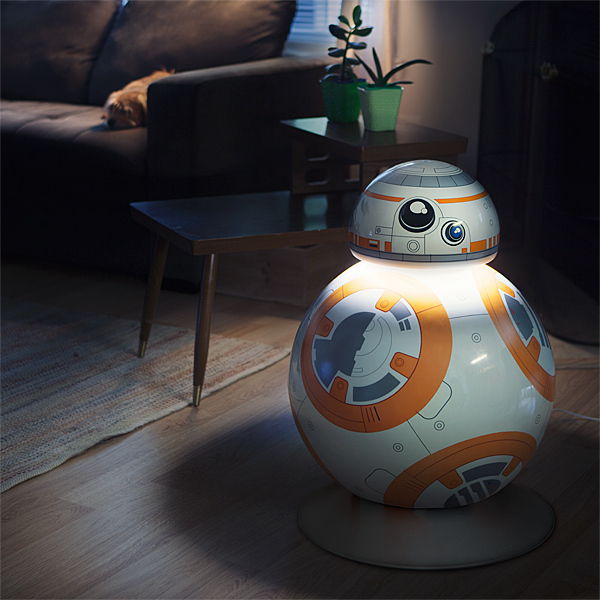 The BB-8 Life Size LED Floor Lamp is $349.99.